Today is surgery day. I’m both happy and nervous. Just a little outpatient on my wrist. I hope to be in tip top condition by August. I thought it would be fun to join in on Shelf Control. Shelf Control — an original feature created and hosted by Bookshelf Fantasies.Shelf Control is a weekly celebration of the unread books on our shelves. Pick a book you own but haven’t read, write a post about it (suggestions: include what it’s about, why you want to read it, and when you got it), and link up! Click here for more info. How I got the book: I found the paperback at a bookstore on clearence. It’s a beautiful cover. I saw the author name and the cover and just bought it. I haven’t even read the blurb on the back. When I bought the book: Sometime in the last year. Why do I want to read it? 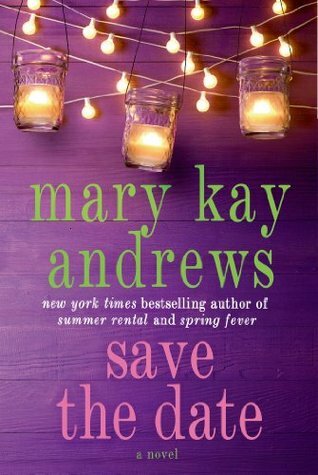 I love Mary Kay Andrews. I’ve read 4,5, maybe 6 of her books. I love them. She writes smart, funny characters. There’s actually two of her books on my TBR shelf I need to read. I don’t know why I haven’t read them yet. I think this is a stand alone. I hope so. I hate reading out-of-order. If you want to participate go to Bookshelf Fantasies and add your link to the linky. What book on your shelf so you need to read? This entry was posted in online groups, Read and tagged shelf control. Bookmark the permalink.